A brand new engagement ring isn't the right choice for every bride-to-be. 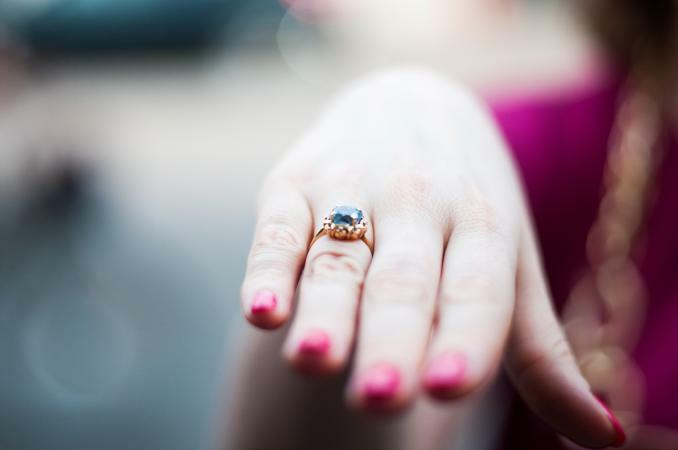 Whether you have your eye on an antique or vintage ring, want to save money on a gorgeous estate option, or simply love the idea of wearing something with some history, there are lots of benefits and a few drawbacks that come with a pre-owned ring. Wondering if a used engagement ring might be the best choice for you? Consider the following benefits. A pre-owned ring isn't one that comes off the shelf at your local jewelry store. You aren't going to see this ring on someone else's finger at the local cafe. Instead, your design will be as unique as your relationship. It may seem obvious that buying a used ring can save you money, but how much you save might surprise you. According to popular engagement ring resale site I Do Now I Don't, buying a used ring can be up to 70 percent cheaper than buying the same ring new. Specialty items, especially antiques, may not offer these savings, but in general, you'll get more ring for your money if you buy used. If you love buying vintage clothing and furniture because you enjoy the sense of history that comes with these items, a used ring may be for you. You may or may not know the story behind your ring, but you do know there is one. That can make one of the most important jewelry items you'll ever own even more meaningful. A used ring isn't like a used car; there's nothing that sets it apart as older or pre-owned. Diamonds and other gems don't degrade with age. If you choose a ring in good condition, it isn't going to advertised that you bought it used. Whether you choose to tell people will be up to you. While your local jewelry store may only have a few standard choices for rings in your price range, there are thousands of different used rings on the market. Specialty sites like I Do Now I Don't and Have You Seen the Ring offer so many options you'll be amazed. If you love having lots of choices, a used ring may be the way to go. Diamond mining, which often involves creating huge pits and removing a great deal of other rock and material to find the gems, can be devastating to the environment. If you purchase a used ring, you aren't contributing to this problem. Even if there are some great reasons to consider a used ring, they aren't for everyone. Give some thought to these possible drawbacks before you decide to go used. Most used rings have been worn, sometimes for decades. Unless you go for a ring that was refused by its intended recipient, the possibility of condition issues exists. You'll need to examine the ring carefully for scratches, dents, chips, loose or missing stones, and bent prongs. Then, have it cleaned and "tuned up" by a jeweler. Even though there are many gorgeous pre-owned rings on the market, you might have to search harder to find the one you really want. The shopping experience isn't as simple as walking into your local jewelry store and asking to see the engagement rings. You'll need to look through vintage and antique stores and pour over listings online. If you don't like spending time this way, a secondhand ring may not be ideal for you. Not all pre-owned rings have a negative history, but many do. Some rings are on the market as a result of divorce or financial hardship. Others are there because someone asked a person to marry them and was turned down or an engagement was called off before the wedding. If you are a little superstitious or worry about negative "vibes" with your ring, you may be happier with a new ring. If you've always dreamt of walking into the jewelry store and picking a ring out of the case, the experience of shopping for a used ring might disappoint. Searching for the perfect pre-owned ring is more complicated and time consuming, and some people may also see it as less romantic. Unfortunately, not everyone who sells used rings is legit. Before you plunk down your hard-earned money, make sure the ring is everything the seller says it is. 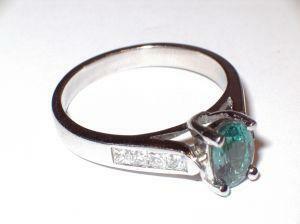 Buy from a reputable seller with good reviews and make sure the ring comes with a jeweler's appraisal. Then, once you receive the ring, have it appraised by your local jeweler too. If all this sounds like too much hassle or anxiety, it may make more sense to buy new. Sometimes, just knowing the ring is used could lessen your enjoyment of it. Even if no one else can tell the ring is secondhand, you'll always know. Be honest with yourself about how you or the ring's recipient will feel about a used ring. If it's not positive, buying used may simply not be worth it. Remember to discuss the idea of a secondhand ring as a couple before buying. It's never a good idea to present a used ring without telling the recipient its history; you don't want to start your marriage with a secret like that. However, if you both feel the benefits of a pre-owned ring outweigh the drawbacks, you'll have tons of gorgeous, unique options to choose from.